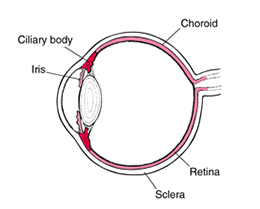 The uvea is a part of the eye, made up of the iris, ciliary body and choroid. Uveitis is when any part of the uvea is inflamed. Uveitis can cause visual loss by a variety of ways, including swelling of the nerves in the retina. Patients with uveitis also frequently get cataract and glaucoma as a result. A doctor can see inflammation in the eye using a microscope, (there are abnormal floating cells). Iritis, when specifically the iris is inflamed, is the most common type of uveitis. Patients with iritis have redness, and are often bothered by light. How do we treat uveitis?